UK on US: Has God Really Chosen Sarah Palin to Lead Our Country?? To millions of Americans, Sarah Palin is the one person who can save the US from the perils of communism, gay marriage and gun control. But can she ever win the White House, or will she destroy the American right? Sarah Palin pressing the flesh in Grand Rapids, on her three-week-long, 14-state promotional "Going Rogue: An American Life" book tour. It is a freezing night in Indiana. A light drizzle is turning to ice as a crowd of 1,000 people shiver and huddle under umbrellas in a shopping mall car park outside the small Midwestern town of Noblesville. But no one is complaining. She, of course, is Sarah Palin, and Going Rogue is the name of her autobiography. The event tonight is the third stop on one of the most audacious book tours in the history of publishing. It is a 14-state, three-week-long trek through the heartland of America that has already drawn tens of thousands of fans. 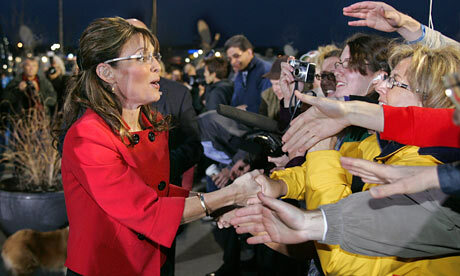 No other figure on the right of American politics can pull in crowds and generate excitement like Palin. Like Obama with Democrats, people believe in her. But Palin World is a very different place from Obama Nation. In Palin World, America is succumbing to the foreign ideology of socialism, and the lifeblood of the free market is being squeezed by Big Government. The threat of “death panels” haunts the elderly. It is a nation of whispered conspiracies that Obama wants to take away people’s guns, and where communist appointees plot secret internment camps and the forced indoctrination of innocent American youth.